Dr. Xin Jin is a Research Assistant Professor in Biomedical Engineering Department. 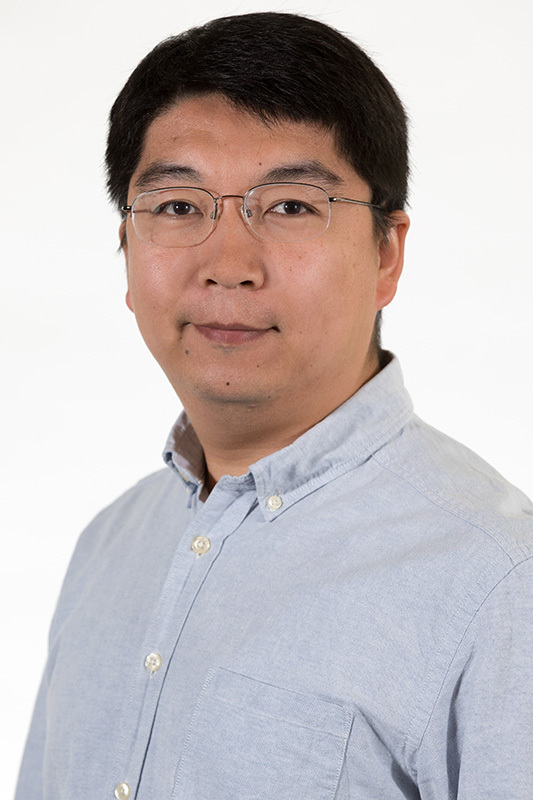 Dr. Jin has extensive research experience has been focused on soft tissue biomechanics, finite element modeling of human body to impact, and experimental studies on blast-induced injuries on the head/brain and lower extremities. Vigdorchik, J. M., Jin, X., Sethi, A., Herzog, D. T., Oliphant, B. W., Yang, K. H., and Vaidya, R. (2015). A biomechanical study of standard posterior pelvic ring fixation versus a posterior pedicle screw construct. Injury, Volume 46, Issue 8, Pages 1491–1496. Shen, M., Zhu, F., Mao, H., Fan, H., Mone, N., Sanghavi, V., Kalra, A., Jin, X., Chou, C.C., and Yang, K.H. (2015) “Finite element modelling of 10-year-old child pelvis and lower extremities with growth plates for pedestrian protection”. Int. J. Vehicle Safety, Vol. 8, No. 3. Ma, H., Zhu, Y., Xiao, Y., Kan, G., Jin, X., Yang, K.H., King, A.I. (2014). Dynamic Changes of Macaque Cancellous Bone Following Head-Down Bed Rest. Aviation, space, and environmental medicine 85 (2), 130-134. Jin, X., Mao, H., Yang, K.H., King, A.I. (2014). Constitutive Modeling of Pia–Arachnoid Complex. Annals of biomedical engineering 42 (4), 812-821. Jin, X., Zhu, F., Mao H., Shen, M., Yang, KH. (2013). A Comprehensive Experimental Study on Material Properties of Human Brain Tissue. Journal of Biomechanics, 46 (16), 2795-2801. Dong, L., Zhu, F., Jin, X., Suresh, M., Jiang, B., Sevagan, G., Cai, Y., Li, G., Yang, KH. (2013). Blast Effect on the Lower Extremities and Its Mitigation: A Computational Study. Journal of the mechanical behavior of biomedical materials, 28, 111-124. Jiang, B. Zhu, F., Jin, X., Cao, L., Yang, KH. (2013). Computational modeling of the crushing behavior of SKYDEX® material using homogenized material laws. Composite Structures, 106, 306-316. Mao, H., Zhang, L., Jiang, B., Genthikatti, V., Jin, X., Zhu, F., Makwana, R., etc. (2013). Development of a Finite Element Human Head Model Validated With Forty Nine Loading Cases from Experimental and Real World Impacts. Journal of biomechanical engineering, 135 (11), 111002. Zhao, H., Yang, G., Zhu, F., Jin, X., Begeman, P., Yin, Z., Yang, K.H., Wang, Z., 2013. An investigation on the head injuries of adult pedestrians by passenger cars in China. Traffic Injury Prevention 14(7):712-7. Song, W., Markel, D. C., Jin, X., Shi, T., Ren, W., 2012. Poly(vinyl alcohol) /collagen /hydroxyapatite hydrogel: properties and in vitro cellular response. Journal of Biomedical Material Research Part A 100(11):3071-9. Vigdorchik, J. M., Esquivel, A. O., Jin, X., Yang, K. H., Onwudiwe, N. A., and Vaidya, R., 2012. Biomechanical stability of a supra-acetabular pedicle screw Internal Fixation device (INFIX) vs External Fixation and plates for vertically unstable pelvic fractures. Journal of Orthopaedic Surgery and Research 7:31. Zhu, F., Wagner, C., Dal Cengio Leonardi, A., Jin, X., VandeVord, P., Chou, C., Yang, K.H., and King, A.I., 2012. Using a gel/plastic surrogate to study the biomechanical response of the head under air shock loading: a combined experimental and numerical investigation. Biomechanics and modeling in mechanobiology 11(3-4):341-53. Mao, H., Zhu, F., Jin, X., Clausen, F., Colgan, N., Gilchrist, M., and Yang, K.H., 2011. Biomechanical analysis of fluid percussion model of brain injury. Journal of Biomechanics 28 (6), A123-4. Jin, X., Yang, K.H., and King, A.I., 2011. Mechanical properties of bovine pia-arachnoid complex in shear. Journal of Biomechanics 44 (3), pp. 467-474. Zhu, F., Mao, H., Dal Cengio Leonardi, A., Wagner, C., Chou, C., Jin, X., Bir, C., VandeVord, P., Yang, K.H., and King, A.I., 2010. Development of an FE Model of the Rat Head Subjected to Air Shock Loading. Stapp Car Crash Journal, Vol. 54, pp. 211-225. Zhu, F., Jin, X., Guan, F., Zhang, L., Mao, H., Yang, K.H., and King, A.I., 2010. Identifying the properties of ultra-soft materials using a new methodology of combined specimen-specific finite element model and optimization techniques. Materials and Design 31(10), pp. 4704-4712. Mao, H., Jin, X., Zhang, L., Yang, K.H., Igarashi, T., Noble-Haeussiein, L.J., and King, A.I., 2010. Finite element analysis of controlled cortical impact-induced cell loss. Journal of Neurotrauma 27(5), pp. 877-888. Jin, X., Ma, C., Zhang, L., Dong, G., Zhang, J., Yang, K.H., and King. A.I., 2007. Biomechanical Response of the Bovine Pia-Arachnoid Complex to Normal Traction Loading at Varying Strain Rates. The Stapp Car Crash Journal, Vol. 51, 115-126. Hu, J., Jin, X., Lee, J.B., Zhang, L., Chaudhary, V., Guthikonda, M., Yang, K.H., and King, A.I., 2007. Intraoperative Brain Shift Prediction Using a 3D Inhomogeneous Patient-Specific Finite Element Model. Journal of Neurosurgery 106 (1), 164-169. Jin, X., Lee, J.B., Leung, L.Y., Yang, K.H., and King. A.I. (2006) “Biomechanical Response of the Bovine Pia-Arachnoid Complex to Tensile Loading at Varying Strain Rates.” The Stapp Car Crash Journal, Vol. 50, 241-262.